Im trying to write a program which is computing surface area of a 3D geometry by using Newell Methods. I can create arrays to use in formulas of Newell Methods and I can compute the area of geometry surface by writing the data in program as hardcode.Also I can make line read from text file.But I cant create arrays and store datas from reading text file. I need to combine those. The program is in below and attached which can calculate by hard code. I need help this to compute the area by reading from text file. Thanks for all suggestions. Are you looking for help with this program? If so could you explain in more detail what your problem is. Thanks for your interest. you find information about program how works. you can find the formula, photo and commnent file in attach. I wanna compute area and normals of surfaces of 3D geometry by using newell formula. First I need the read datas of geometry from a text file. This datas should be read into arrays. The program which I sent in below reads datas from hard codes. ( Which I wrote in "edges" array.) This array should be stored from text file. 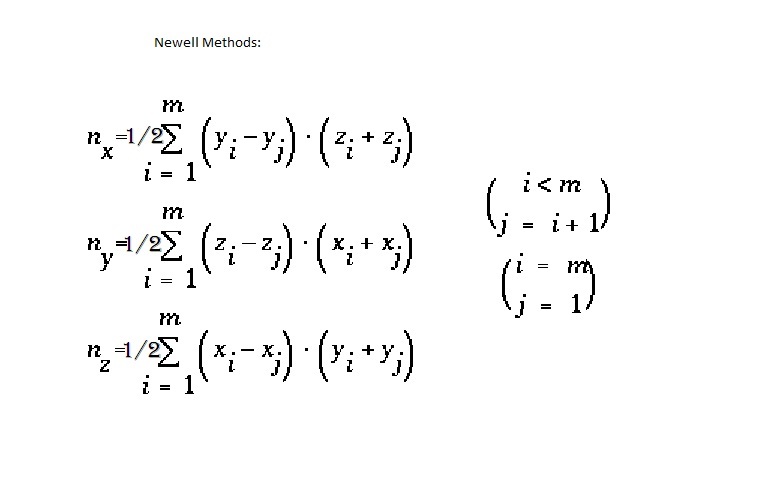 For newell formula, The variables should be read from faces composition array. And It should be calculated for each surfaces and sum of all by using " nested for loops" . the text file defines a rectangular prism. For each surfaces I need to calculate newell formula. Serie's upper limit,m is number of surfaces. This serie will calculate in "for loop" ( i=0 ,i<6, i++). While "for loop" is calculating formula, it needs to y_i and z_i variables. The main point for me is begening here. 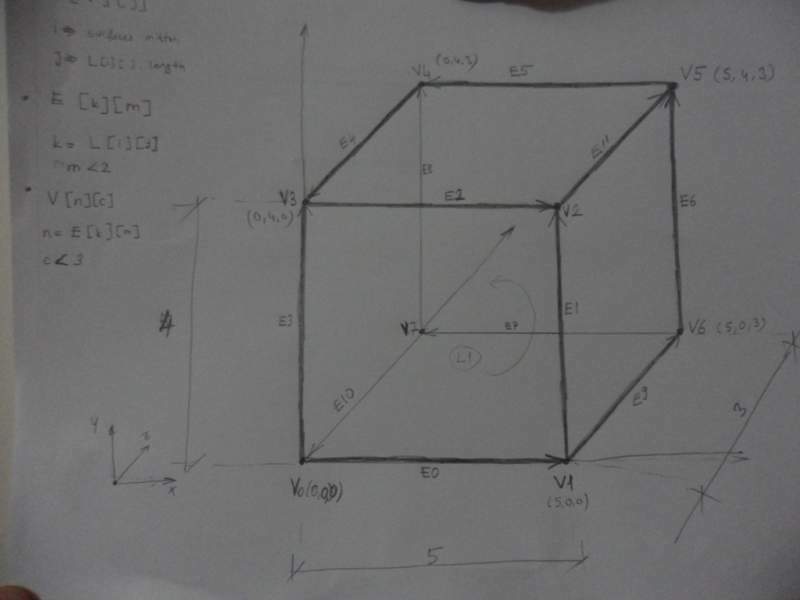 I need to read x,y and z values connectivited eachother by edges and surfaces. And I made read these values in "nested for loops " by reading from hardcode(from line10 to line34) . But I need to read the values from text file in "nested for loops". Coz when I change the geometry ( when I create the new text file belong to different geometry) I can calculate the area of surfaces. By reading from text file , The upper limtits of series and loops will be independent. Can you show the code you are having the problems with? I have no idea what your program is supposed to do, but I might be able to help you read data from a file and store it in arrays in your code. I sent the codes in attach by first message. And Im writng new one. I will send it again.